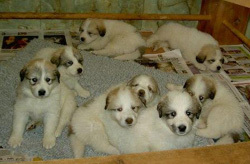 Pyrenean Mountain Dog Breeders & Puppies For Sale If your a Pyrenean Mountain Dog breeder and have Pyrenean Mountain Dog puppies for sale, send us your details for free and we will add to our Pyrenean Mountain Dog Breeders page. 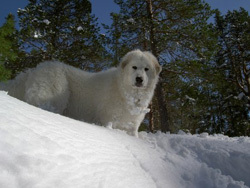 Pyrenean Mountain Dog Rescue Center Visit the Pyrenean Mountain Dog rescue centers if your looking to rescue a Pyrenean Mountain Dog , as well as learn more about the breed or just support the rescue centers for there hard work. Origin / History The Pyrenean Mountain Dog, known in the United States as the Great Pyrenees, is an old breed native to southern France. It was used by both the French elite and the peasant class, the former as a guard dog and the latter as a working dog and flock protector. It may also have worked as a war dog, although their temperament has mellowed out over the years. The dogs spent most of their time on the isolated Pyrenees mountain range, developing such valuable traits as guardianship, loyalty, and a sense of devotion to its master and its charges. Like many other breeds, the Great Pyrenees’ origins are still under debate. However, its most likely ancestors are the Maremma Sheepdog and the Kuvasz of Hungary. Although they first appeared in Europe from 1000 to 1800 B.C., many believed they migrated from the much colder mountain ranges of central Asia. Appearance Their long, rough coat is double-layered, consisting of a soft, insulating undercoat and a coarse overcoat that protects it from the elements. The head is wedge-shaped with a scissors bite, and the ears triangular and hanging down. It is usually distinguished from similar-looking breeds by the double dewclaws (extra claws) on its hind legs. Colours This breed comes with a white coat, either solid white or with patches of brown, tan, gray, badger, or reddish brown. For show purposes, however, the patches should not cover more than one-third of the body. Temperament The Great Pyrenees is loyal and affectionate to its family, but tends to be distrustful of strangers and other animals. Most of the time, they are calm and well-mannered, only barking or attacking when provoked or when it senses danger. It is very protective of its family, sometimes to the point of self-sacrifice. A well-socialized dog can even be trusted to guard children and other pets when the owner is away. Height and Weight 66 - 81 cm in height and 41 - 50 Kg in weight. Males are larger than females and at the top end of the size ranges. Common Health Problems The Pyrenees’ hardy nature keeps most diseases at bay, but hereditary disorders can sometimes occur. Hip dysplasia is fairly common, as it is with other large breeds; this can be prevented by keeping the dog’s weight under control. Pyrenees are also prone to skin problems, especially in hot weather. Living Conditions These dogs are born for the mountains; they are not suited for apartment life. Pyrenees need their space, even when indoors—there should be enough room for them to stretch and move around. Owners should have at least a small yard where the dog can run free when it wants to. Some dogs even prefer to stay outdoors most of the day, regardless of the weather. However, they should be sheltered on very hot days, as the heat can affect their energy levels. Exercise Requirements Pyrenees should be kept in shape with plenty of exercise and play. They are happiest when they have something to do, whether it’s running alongside your bike or retrieving toys from across the yard. Long daily walks or jogs are recommended. Training Requirements Training a Great Pyrenees requires patience, as this dog can be somewhat stubborn and follow its own agenda. Owners should establish dominance early on. Firm, consistent training works best, but harsh methods and physical punishment should be avoided. Socialization is also necessary to avoid aggression and combativeness with other animals. Life Expectancy Great Pyrenees live an average of 10 - 12 years. Grooming Grooming should focus on the undercoat, which tends to shed heavily and get tangled in the outer coat. Regular brushing with a firm brush will prevent matting and keep the coat manageable. Baths should be given only when needed, paying close attention to the ears, mouth, and feet. 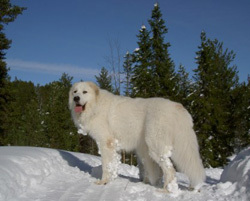 More Pyrenean Mountain Dog Information: Check out our Pyrenean Mountain Dog Clubs and links to more informative websites dedicated to the breed.